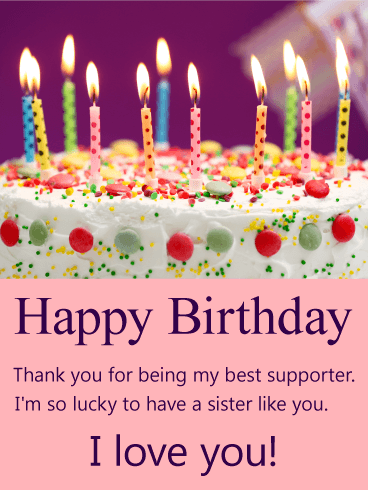 There's nobody as sweet as your sister. 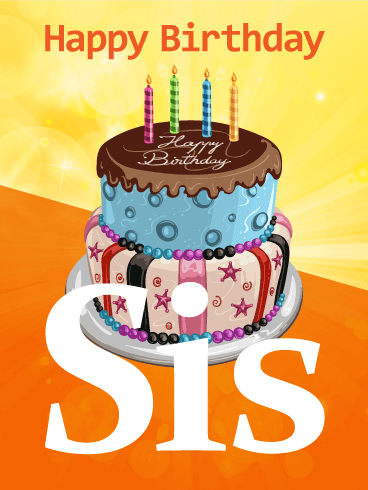 On her birthday, let her know she deserves the "biggest & brightest celebration ever" with this fabulous birthday card! 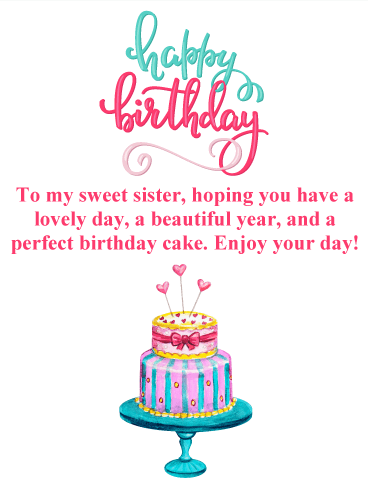 A pretty light pink background and decorative pastel cake bring a sweet, feminine touch to this heartfelt greeting, while the brightly lit candles will have her ready to make a wish for an amazing year ahead! 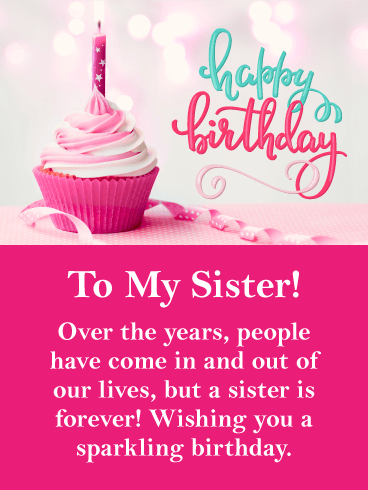 No one is quite as special as your sister. 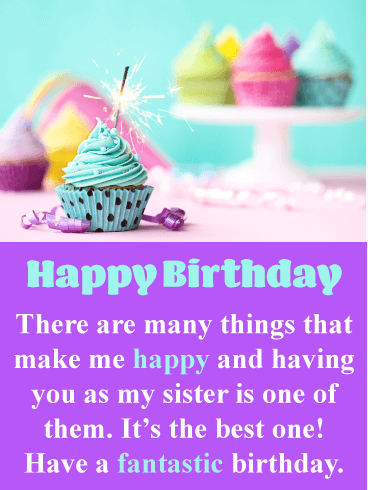 And even if you don't tell her every day, this delightful birthday card will help you express exactly how you feel on the most special day of the year...her birthday! 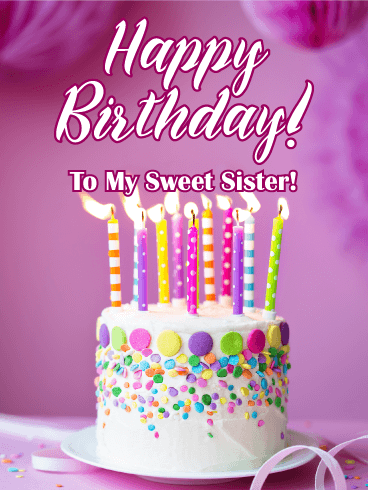 A pretty purple background, complete with charming white polka dots, brings a fun and festive feel, while the beautifully decorated cake in front adds to the celebration. Of course, it's the sentimental words from you that will really make her feel loved and remembered! 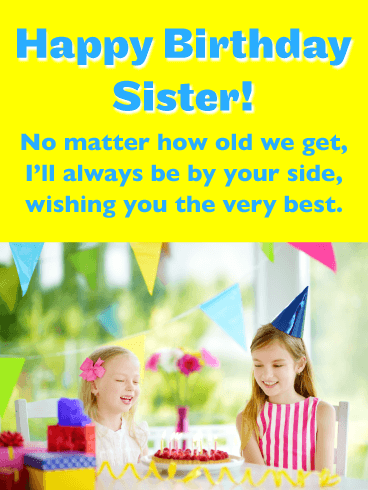 Your sister is awesome in every way...and this bright, fun birthday card will let her know! A vibrant, colorful background helps illuminate the dazzling decorated cake in front. Topped with candles just waiting to be blown out, it's a wonderful reminder that you're sending your warmest wishes for an amazing celebration and an even more wonderful year ahead! 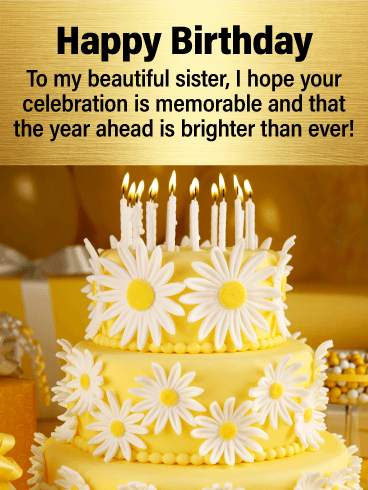 A close up of brightly lit candles on top of a beautifully frosted cake (complete with colorful stars) will warm your sister's heart as she celebrates her birthday this year! 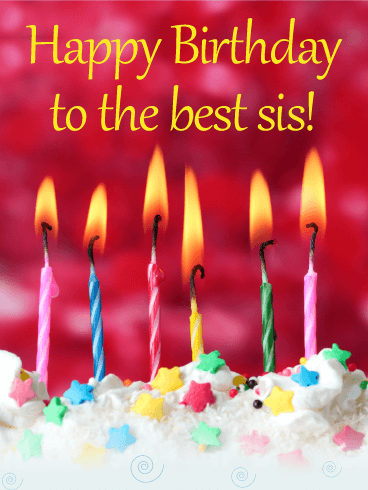 Each flame is a wonderful reminder of all the wishes she's yet to make on her special day. 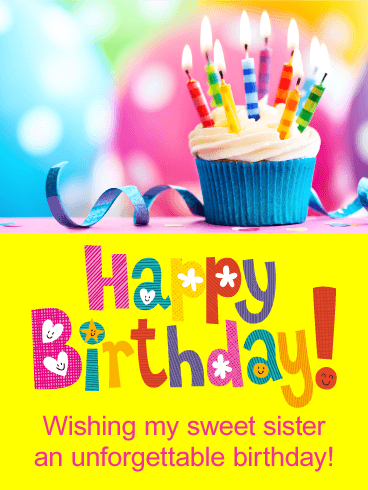 And above, in bold yellow letters, is one very important wish: the one you're sending to the very best sister in the whole wide world! 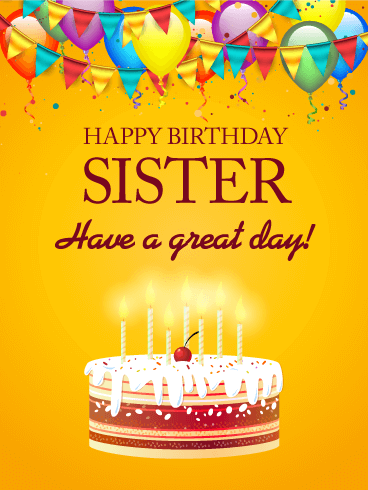 The festive birthday cake on this card brings with it your most heartfelt wishes for your amazing sister! The bright yellow background creates a warm glow, adding to the delight. 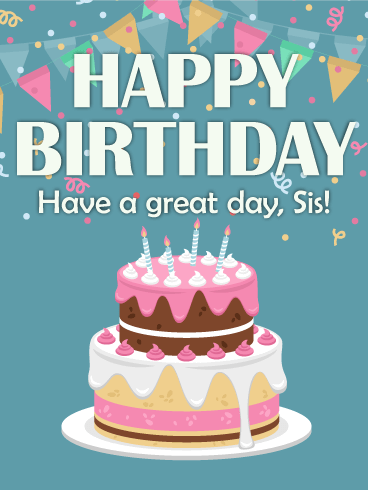 Someone so special to you deserves to be remembered on this important day, and whether you're there celebrating with her or thinking of her from miles away, this sweet birthday card is sure to make her feel like a star! 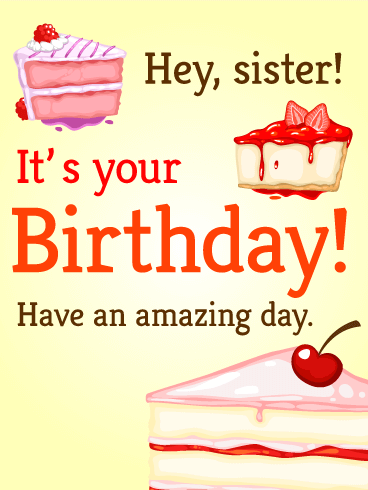 What a yummy birthday card! 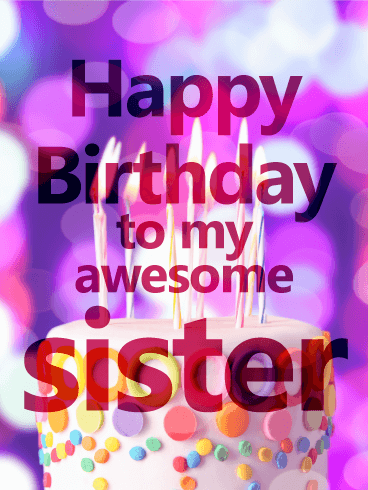 Your sister's birthday is the perfect time to celebrate just how awesome she is! 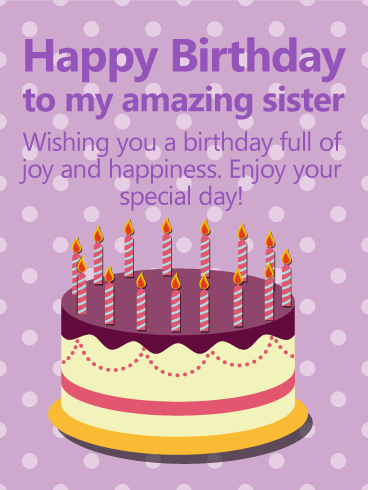 Send her a scrumptious and funky birthday card and tell her she's the best sister in the world. 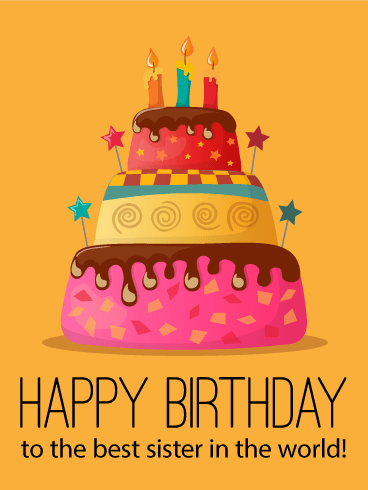 This fantastic birthday cake card is full of swirls, confetti, and stars. 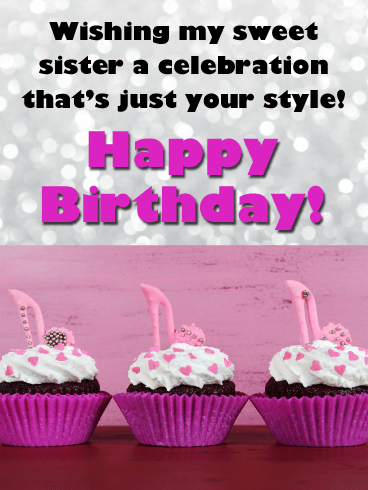 It's dripping in a chocolate glaze, and is a treat for the eyes on your sister's special day! This cupcake is picture perfect! 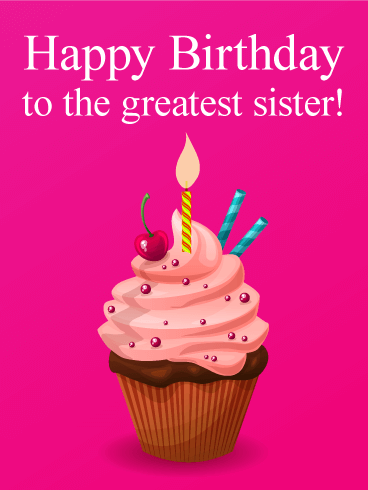 Send a scrumptious birthday card to your sister today and brighten up her birthday. 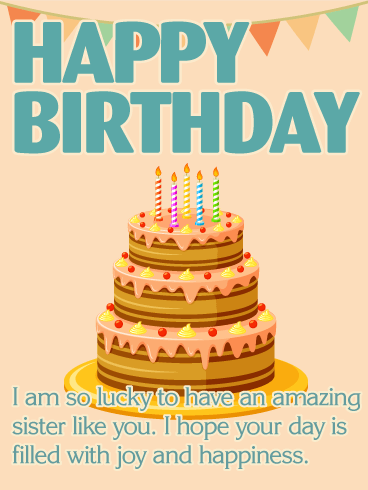 Say happy birthday and let her know she's your favorite. She will love the rainbow sprinkles and bright pink frosting. The cupcake takes center stage amid the hazy warm candle light in the background. 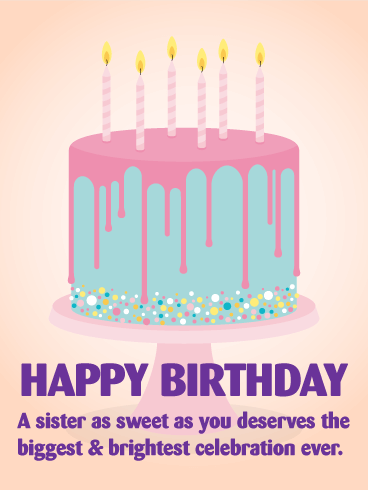 This birthday card is good enough to eat and a decadent way to wish her a beautiful (and delicious!) birthday. It's raining sprinkles! Now that's what I call a party! 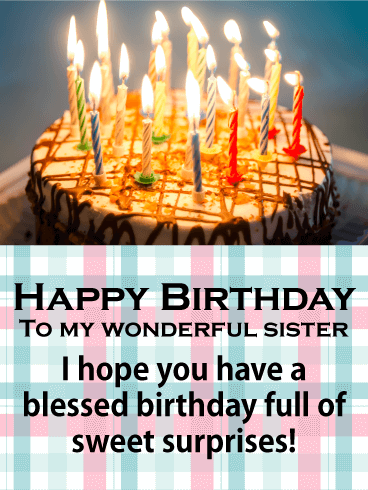 Wish your wonderful sister a very happy birthday with this terrific birthday card. 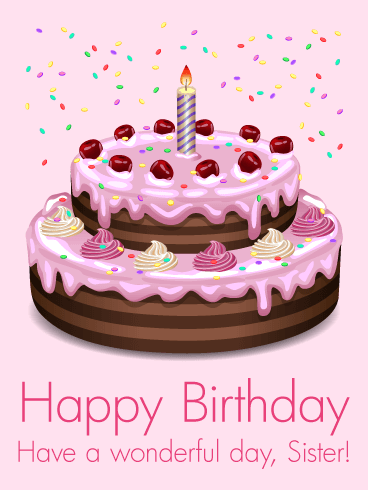 The birthday cake is a double-decker dripping in sugary frosting and decorated with juicy cherries. 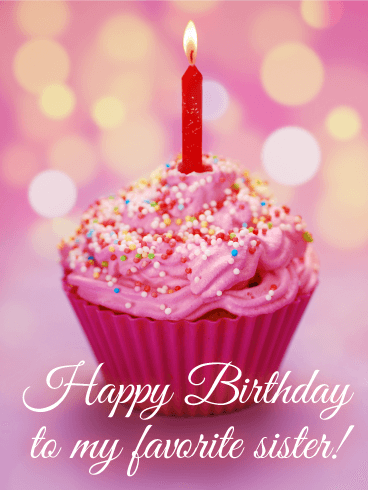 A whimsical cake and one perfect wish-have a wonderful day! 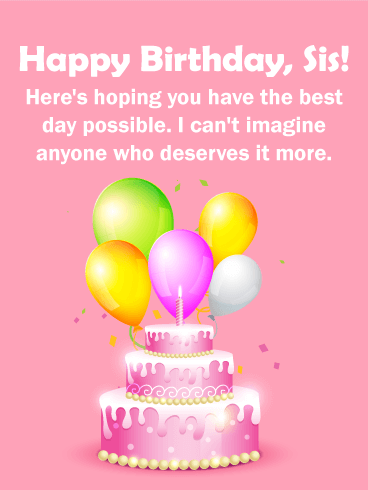 Send it now to add to the celebration and spoil her rotten. She deserves it after all! At least for today! 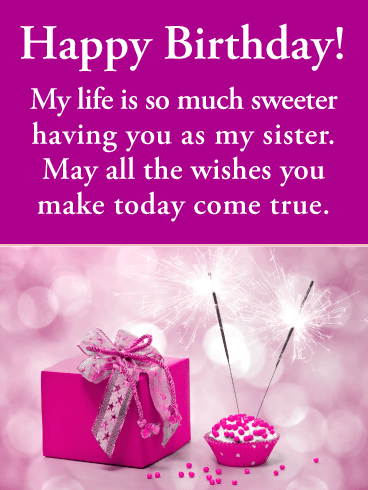 Shimmer and glitter-that's what this birthday card is all about. 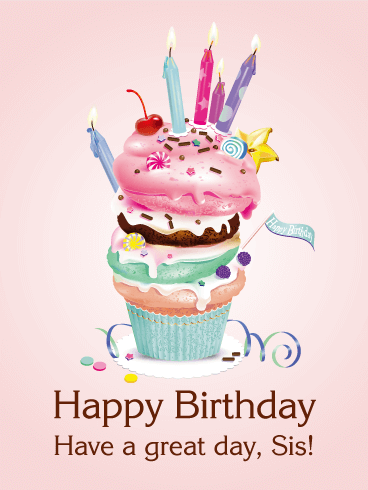 Rich, pink frosting swirls on top of the yummy cupcake with sprinkles and a polka-dotted candle. But it's the sparkler that really gets our attention. 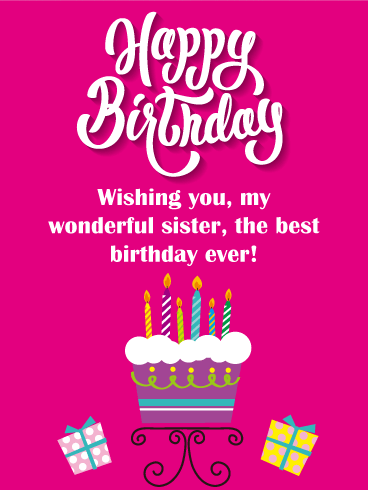 If you think your sister is fabulous, send her a fabulous birthday card to add some dazzle to her day. 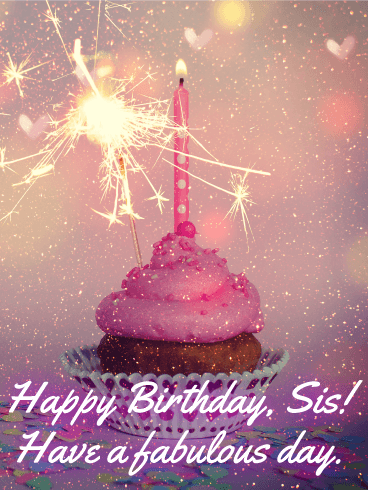 She's your sis and you love her, so let her know with a fun birthday card that truly sparkles.